Entering into the Fall 2015 launch dates, REV’IT! is releasing a pair of new jackets in their city styling that is extremely popular in Europe, and spilling over into the US. The casual two wheel rider in an urban environment is someone who has to be well protected for low-speed impacts, while still maintaining a certain level of fashion and design for their underground/rooftop/cafe bars that their bikes are likely to be parked right outside of. Pairing a protective jacket with something you can meet your future husband/wife in has always been a difficult task for manufacturers, however, REV’IT! is leading the pack and is setting the new standard. One of the biggest fashion faux pas in the motorcycle realm is branding; i.e. manufacturers worked hard to make their jacket and want everyone to know that the great looking quality jacket seen on Johnny Rider, is of their design. Yet with the new REV'IT! Tyler Jacket, REV’IT! did just the opposite. The Tyler is a great option for those who do not want to be a walking advertisement without sacrificing any of the protection. A thermal-detachable liner and a breathable/waterproof Hydratex liner are paired together to form a great winter style coat that can battle the elements, and still be the coat of choice for riding to either work or the bar. 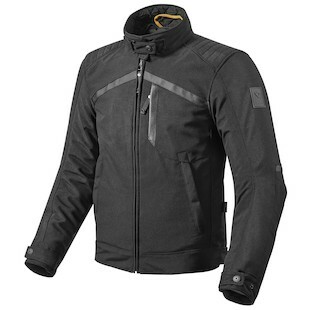 This particular jacket’s style is still closer to a standard motorcycle jacket design with their aggressive cut than a winter blazer, but offers a very low-key and well hidden amount of protection to keep all of your skin and bones intact. REV’IT! is also releasing the most stylish of the urban/city style to date in the new REV'IT! Dayton Jacket. 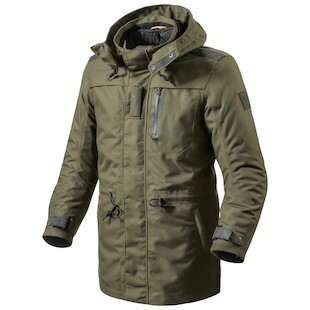 When broken down to its core elements, this jacket is a Hulk-style transformation caught mid-way between a winter parka and a motorcycle jacket. If you are the type of rider who buys one item and expects it to do multiple purposes, the Dayton may be your best bet. Why have a jacket for riding in the colder season and another for walking in the snow to the pub? This jacket does both. You have a well designed outer shell for low speed impacts and slides which does not sacrifice style, whiling being able to walk to the local bar in a storm that resembles Luke Skywalker’s excursion on the planet Hoth. As I previously stated, marrying style and safety has always been the mythical Sasquatch in the motorcycling world, some think it is out there (and it may be) but so far the only glimpse/evidence has been rough, pixelated, and not very well liked. REV’IT! is leading the way in a department that is growing in popularity here in the states, for those trying to replicate what life would be like in an Austrian village without abandoning their two-wheel best friends. Ride on my friends, onward and to the pub, regardless of winter weather and the party’s formal attire, those cocktails/wine glasses will not drink themselves!